I have probably said this over and over (and over)....... but so far my absolute favourite part of being a Stylecraft Blogstar was the BLOGSTAR MEET UP on 4 February 2017. Besides getting to meet all the other lovely Blogstars we were treated to a mystery pack of Stylecraft Yarns for Spring 2017. 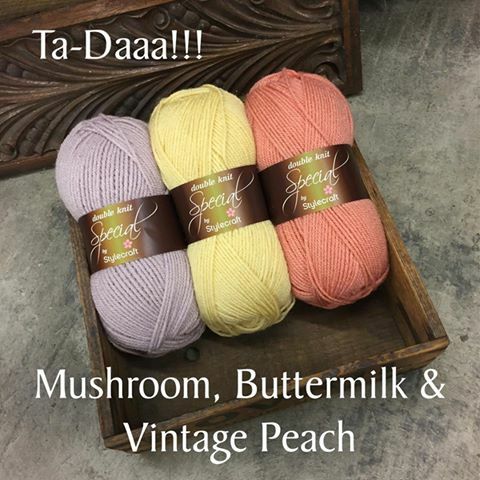 Three stunning "vintage" colours were added to the Stylecraft Special DK range and I could not wait to try out a few colour combinations! Aren't they just too pretty for words???? The three new colours are gorgeous together and so I wanted to add additional colours that would really make them stand out. I used double rows of each colour for the bag in the following order: Buttermilk, Vintage Peach, Apricot, Mushroom & Walnut. 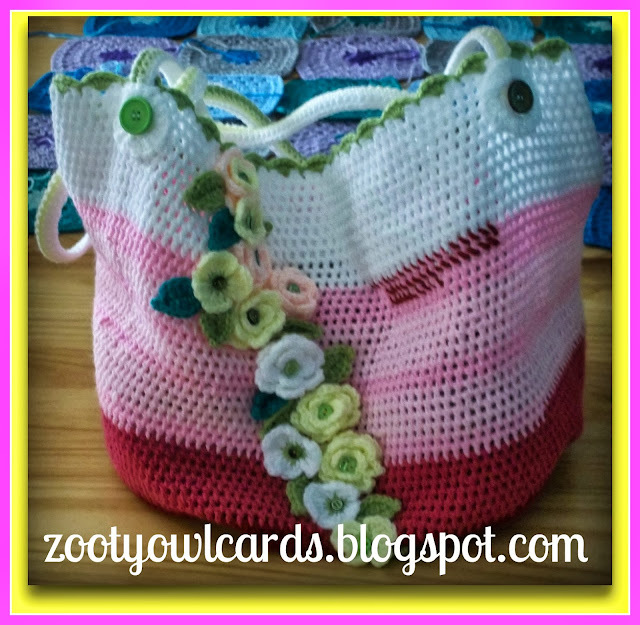 I have made quite a few "FAT BOTTOM" GRANNY BAGS using a "modification" of a pattern I found on the internet. 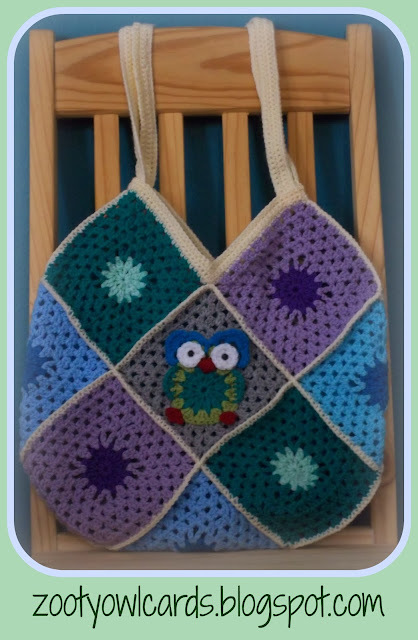 I wanted a bag that didn't look quite as casual, with a separate lining that could be worked into the bag without sewing through the crochet square, with neat, sturdy handles. I am quite chuffed with the bag I came up with. Went to the shops with this bag yesterday, and quite a few ladies stopped me to admire my bag. 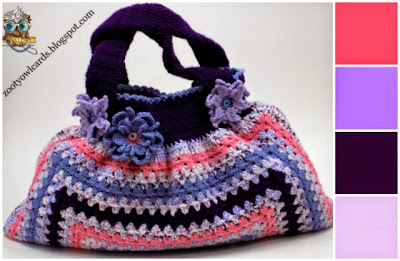 "Gorgeous" was the most popular comment, hence the name "Gorgeous Granny Bag"
I made quite a few of these with a mix of variegated and solid colour yarn. They make lovely thoughtful gifts - each and every one of my "girlfriends" will be sporting one of these this winter! I have made so many of these 13 Granny Squares Bags - they are just so quick and easy to make! About 25g of yarn for finishing and the handle. Crochet two rows of sc aound the opening (doing a 3sc tog over the "v"). Fold Piece B over Centre of Piece A and secure tightly to form a bow. One afternoon last week hubby and I had to run a few errands along the "not-so-scenic-route". Not wanting to be bored during the drive I grabbed my RAINBOW SQUARES on the way out. 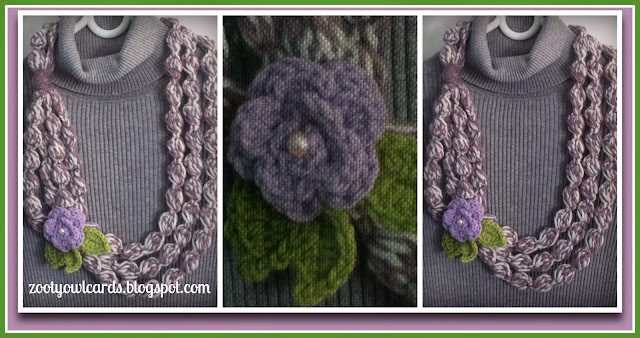 There were only ten squares left after I had used the greens, blues and violets in another project. 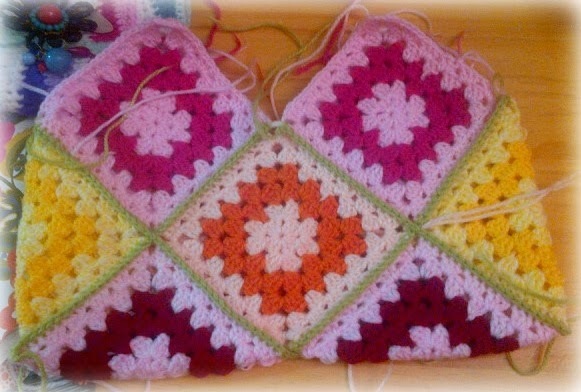 I Managed to make each square 2 rows bigger during the drive and when I got home I just knew what I wanted to make. Brought the side squares around and worked them onto the top square and bottom half square. Then I joined the sides of the front top squares to the sides of the back top squares. Sewed the strap in over the side join on the inside of the bag. And this one taken outdoors! Did not think that these would be quite so popular, but I have had numerous requests for a pattern. I had no idea what the knot was called so I just googled 'knotting yarn together" and I discovered it is called a MAGIC KNOT. 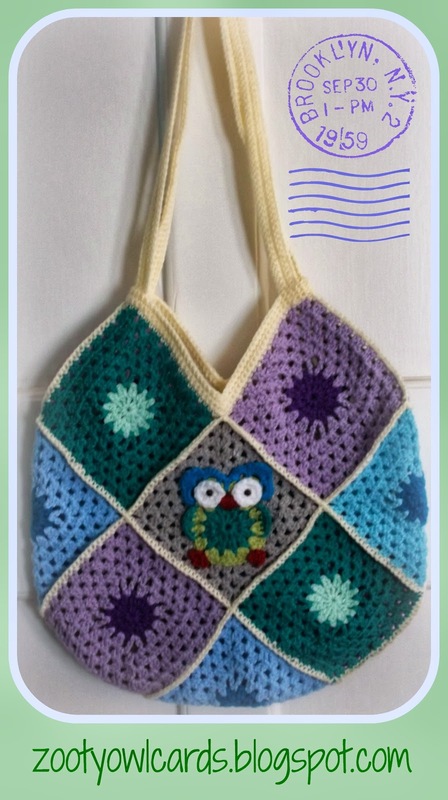 I don't really like using this to join new yarn if it is an item I am giving as a gift or selling - but hey! since I am making these for myself!! Grab whatever hook you normally use for DK (for this project I used a 5.00mm hook as the looser stitch adds to the shabby look) and lets get hooking! This size is great for toting around smaller on-the-go projects like granny squares and scarves. 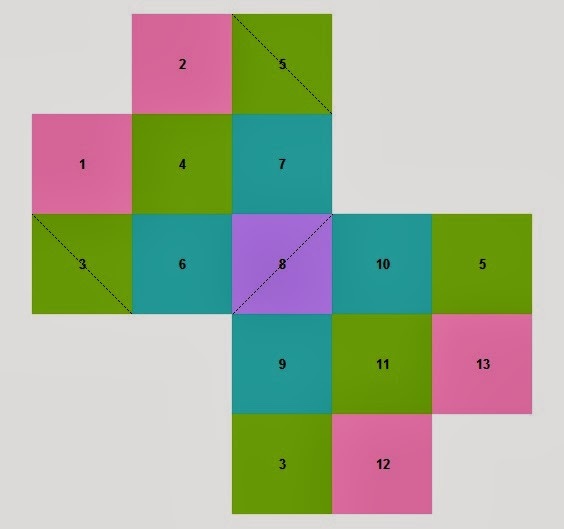 Round 5 - 10: For each subsequent round continue to do 2dc into the space between the 2dc of the previous row and one dc into each of the spaces between single dc (on each row you will have 1 more stitch between 2dc's that on the previous row). This means that every row increases by 12 stitches - thus keeping the work flat for the base of the bag. For this bag I have done 10 base rows - ending with a total of 120 dc (pretty easy calculation to get your dc number - row number x 12). To make the bag bigger just add extra base rows and a few more side rows so that the bag does not look out of proportion. Note: This narrows the opening of the bag ever so slightly - I prefer it that way. If you prefer a wider opening repeat round 11 for Rounds 21 - 22. *3ch, 2dc, skip 1dc, ss into next dc* repeat * to * end making a slip stitch into the base of the first 3ch on the final repeat. Break off yarn. 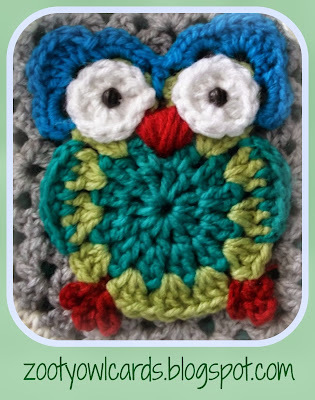 Here I use a single colour per row so the handles are quite "neat" in contrast. The join on every row is a bit obvious since we are using odd yarn. Fold the bag so that the join runs where you would like to position your flowers, as this is the line we are going to use as a placement guide. Position the handles and sew them in. I position mine 12 dc in from the sides and 2rows below the edging. Join second colour in sp between any 2 dc. You will need 6 to cover the join line. I start sewing in from the top to the bottom - less risk of puncturing your hand! And that is it!! Ready to use!! Thursday I spotted a very unusual colour combination, which I could not wait to try. 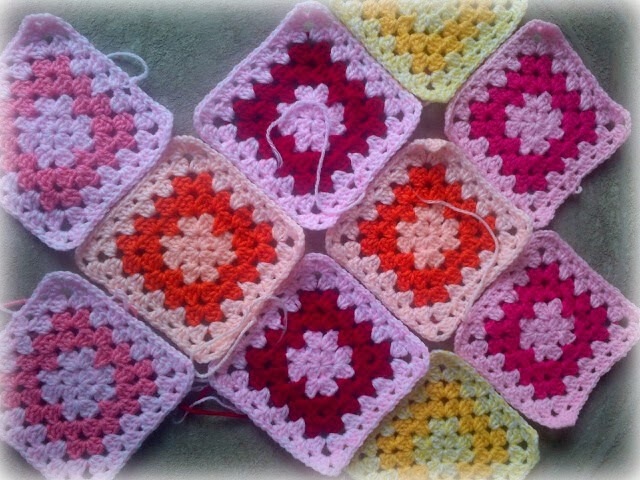 As soon as I got home I started crocheting a Giant Granny Square (well it would end up that way!). 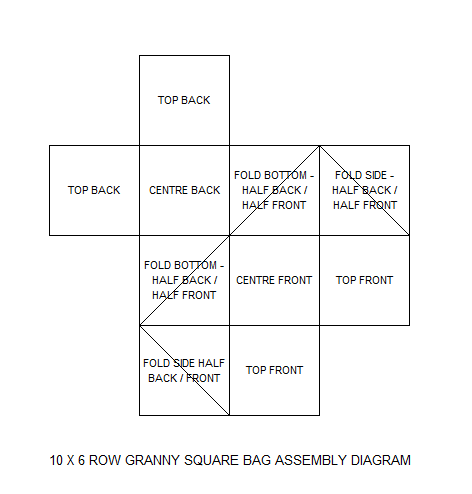 As it grew, so did the idea of a big floppy Giant Granny Square Bag. 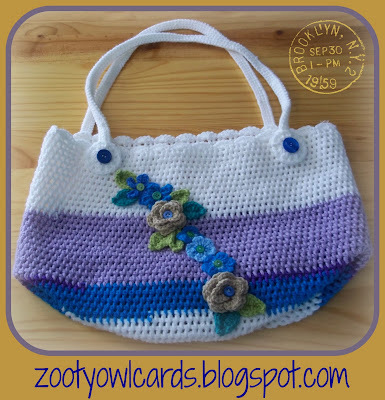 I was all but obsessed with these new lovely colours and the idea of the big floppy bag! As usual there are a hundred versions of the same thing on the internet! After a bit of research I decided I liked this JAPANESE Version! I did not really follow the pattern (only sort of) - I am lazy that way!! At this point I had one of those "oh-no-this-is-never-going-to-work" moments - one seriously misshapen piece of fabric. 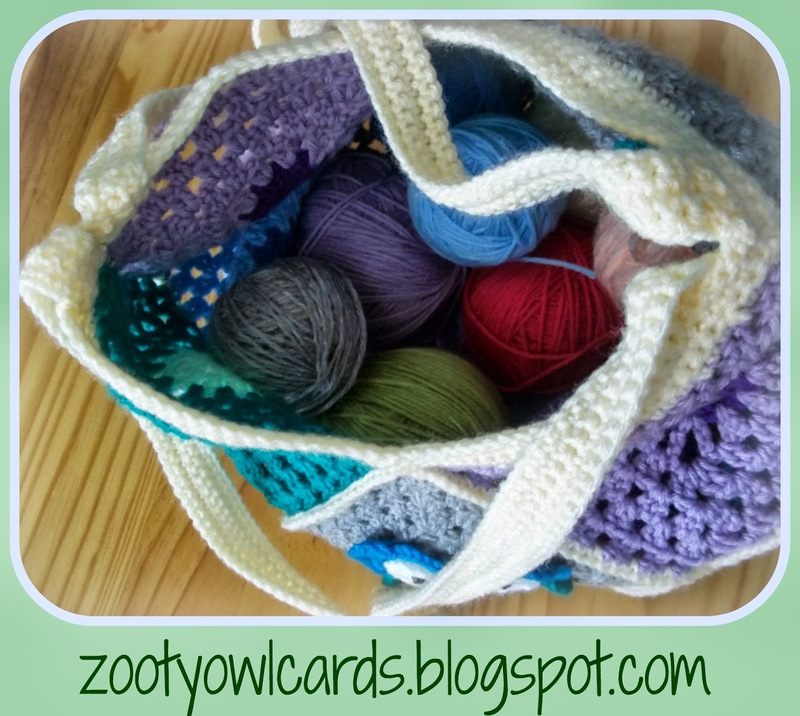 There are no less than three bags in my WIP's basket - they are almost finished, even the ends are worked in - but I still have to do the straps (UGH!! hate that even more than working in ends!). This bag was about to become number four when I had a brainwave. Added a big flower to cover up the "securings" and VOILA!! I love this bag! I have two odd balls of variegated cotton blend in my stash - am so making another one! The popcorn stitch has been "popping" up all over Pinterest, and I was suddenly inspired to use some really bright colours I had in my stash. 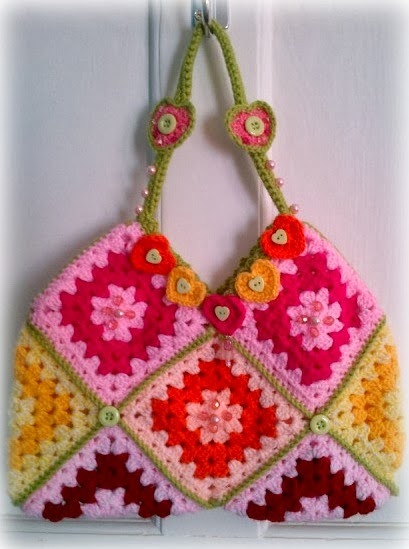 I made one of these GRANNY SQUARE BAGS a while back - you only need 13 squares and the bag works up in no time at all. I am so totally in love with these delightfully puffy flower centres that I have used them on a whole lot of colourful projects - I cannot wait to show you what I have made! 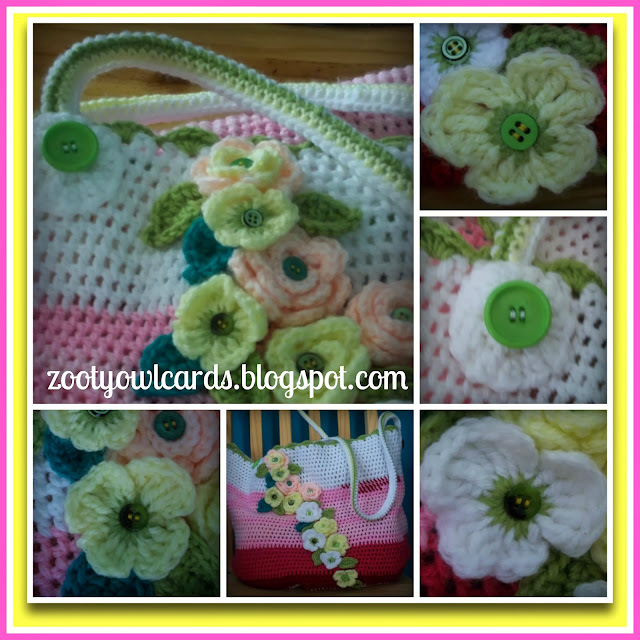 I have been super busy the past few days - gardening, making baby blankets and crochet bags for my WIP's. We have had so much rain - and there is nothing like rainwater to get everything growing at an amazing rate! The growth along some of the pathways had to be trimmed. Jasmine and ivy had to be tamed. The lavender garden had also grown a bit wild and needed some serious tidying up. About half of the rose bushes got a light pruning after the first flush faded and there was plenty of deadheading to be done on the gerberas and different varieties of daisies. My cycads are unbelievable! One of them has almost forty new leaves - WOW! Was a bit stressed out this afternoon - it started to hail, a few fairly big hailstones - luckily a bit of a storm in a teacup and it passed over before it could do any damage. I love it to bits - definitely going to be making a few more of these! 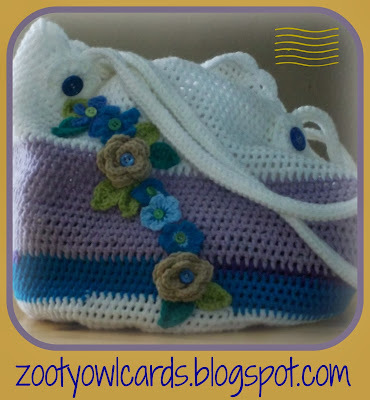 The bottom is dark grey with a bit of teal, then white, turquoise, a teeny bit of dark purple, lilac and then white. All four project bags are filled with my current WIP's - neat and tidy, and ready to go at a moment's notice! Still awake at this late hour as I was catching up on Series (I like to save them until I have quite a few episodes and then watch them back to back - while blogging, crocheting and munching on crisps) - one of the advantages of having grown up children and no boss to report to in the morning!! One final cuppa for Mr Owl and myself and we can call it a day! I spent about an hour writing this post and then I just ran the backspace / delete key through it! I don't think you want to be bored by an endless account of what I have been up to for the past two-ish weeks, instead I will just show you some of the things I have made! I made up quite a few strings of "yarnberries" - this was the prototype for the assembly. Still needs a bit of work. Was thinking of using more, smaller flowers and perhaps felting them first. Also maybe adding a few pearls or beads here and there to the strands. 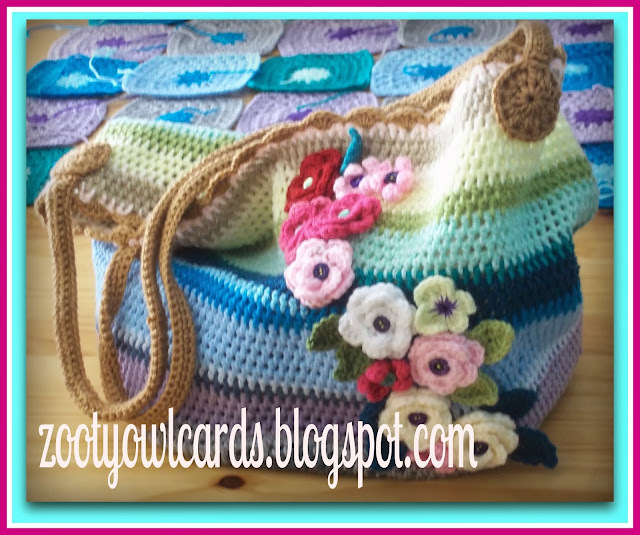 I just kept joining each new colour with a double knot - which meant that I had only four ends to work in when I was done - two for the bag and two for the shell border! 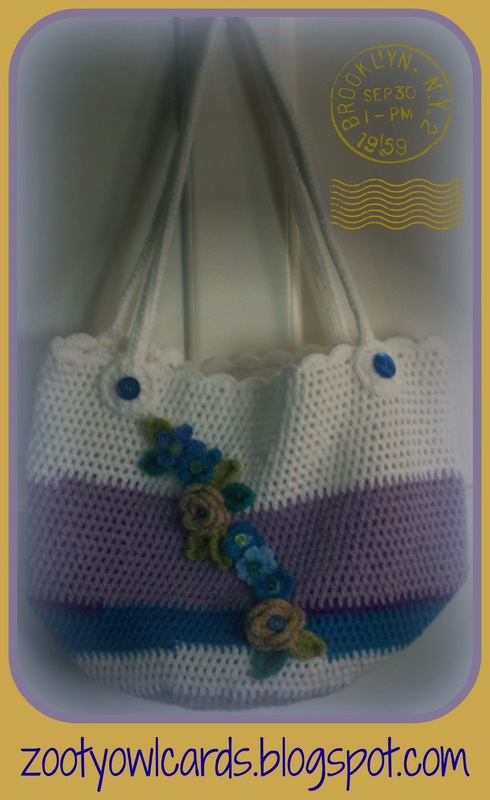 I wanted the bags to have a shabby look - love the "uneven" double crochet where the knots are. 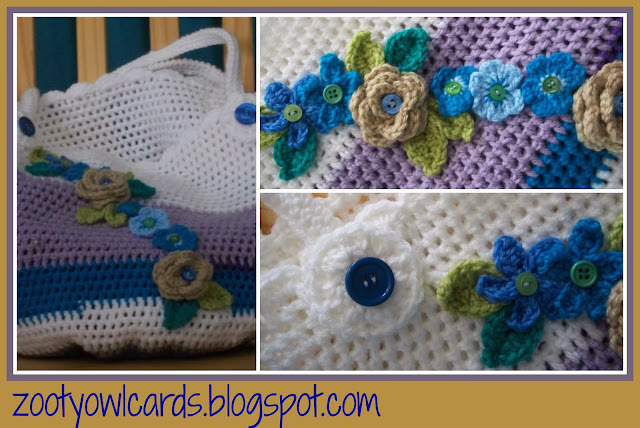 Added lots and lots of flowers and leaves I had been making up from small leftover bits of yarn, using small buttons for the flower centres. Midnight has just passed (today has just become yesterday, and tomorrow is now today!!) - off to dreamland for me! !